To me, it seems like they get better each year. (You can hear what other brides think here and here.) Some of the elements remain consistent, like the show floor with exhibits from Disney’s various event-related divisions and select outside vendors. Others are refined each time, like the sales consultant meet ‘n’ greets that have evolved into appointments in a separate salon. The basic structure is a four-hour exhibition interspersed with seminars. 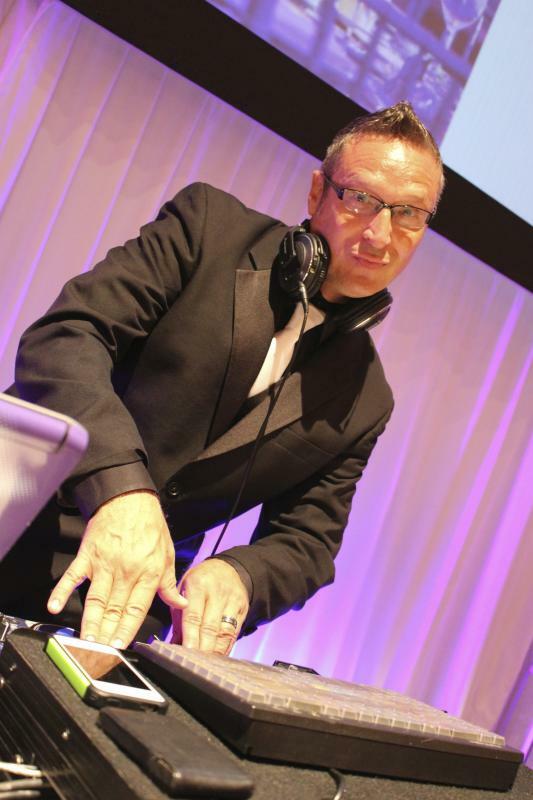 The headlining act for the last two showcases was David Tutera, who in 2013 held a veritable revival meeting for a crowd of evangelized brides. Now that his Couture Collection of weddings has been quietly dropped and he appears to no longer be in cahoots with Disney, I wondered how they’d fill the void. Turns out it’s pretty easy to fill the void… all you need is a $2,900 projection-mapping cake! 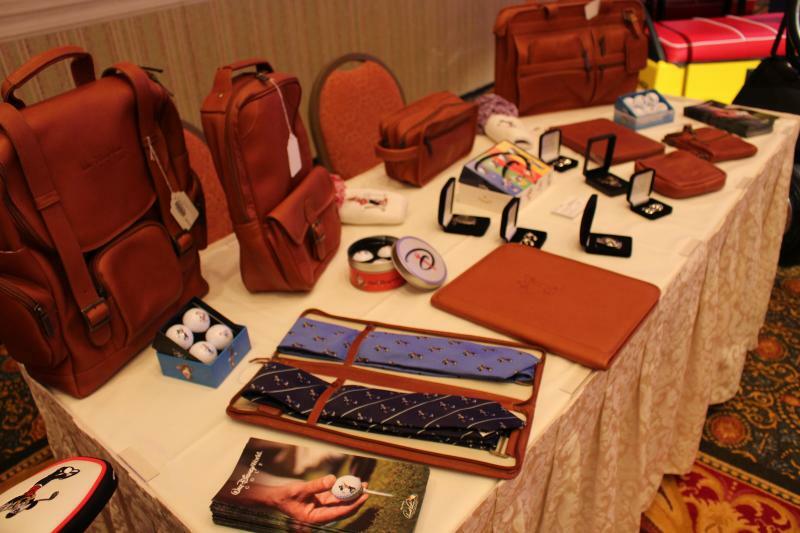 The 2014 showcase was held at the Grand Floridian Convention Center and ran from 10am to 2pm, with one-hour seminars at 10:30am and 12:30pm. 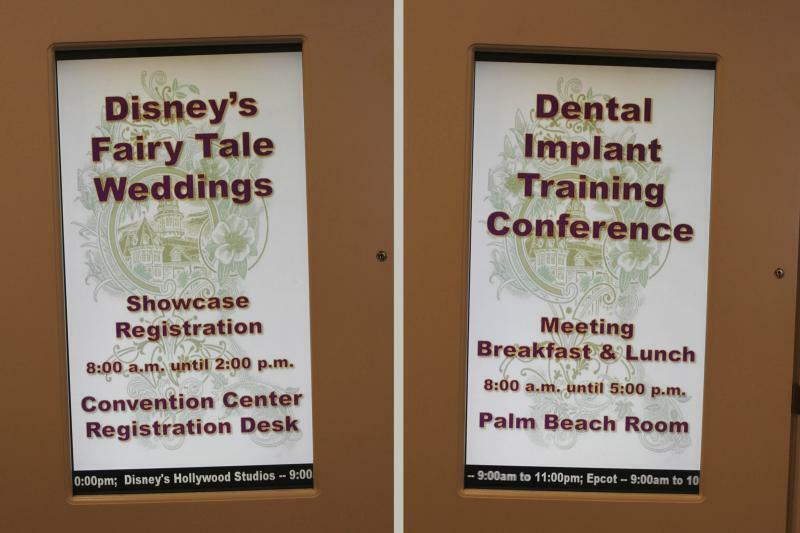 The seminars were “Be Our Guest,” which focused on selecting food for the wedding, and “Edu-taiment 101,” which was a presentation by Disney Floral & Gifts and Disney Fine Art Photography. Registration was $15/person, and the seminars required reservations but were free. 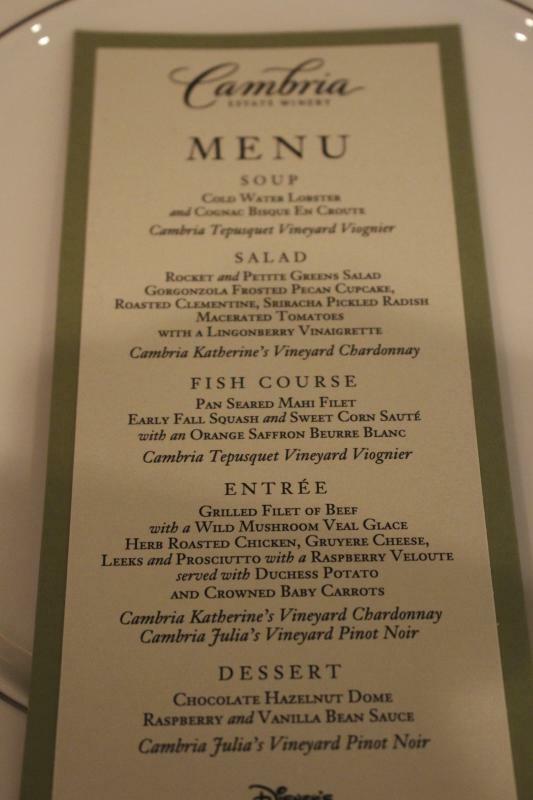 After the showcase ended, there was a separate food and wine tasting that ran from 2:30pm–4:30pm and cost $106.50/person. 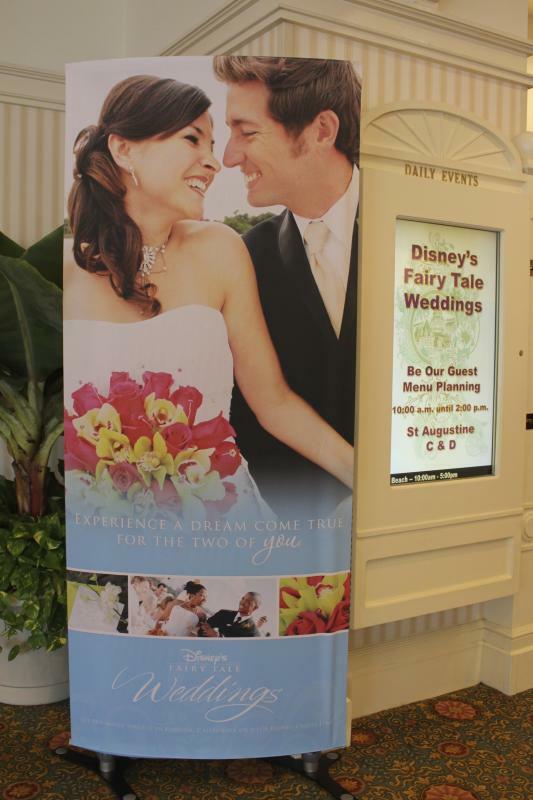 Couples also had the opportunity to sign up for one-on-one sessions with Disney’s sales consultants, something that’s especially valuable when your wedding date is beyond the 16-month window in which DFTW will start talking to you about planning an event. 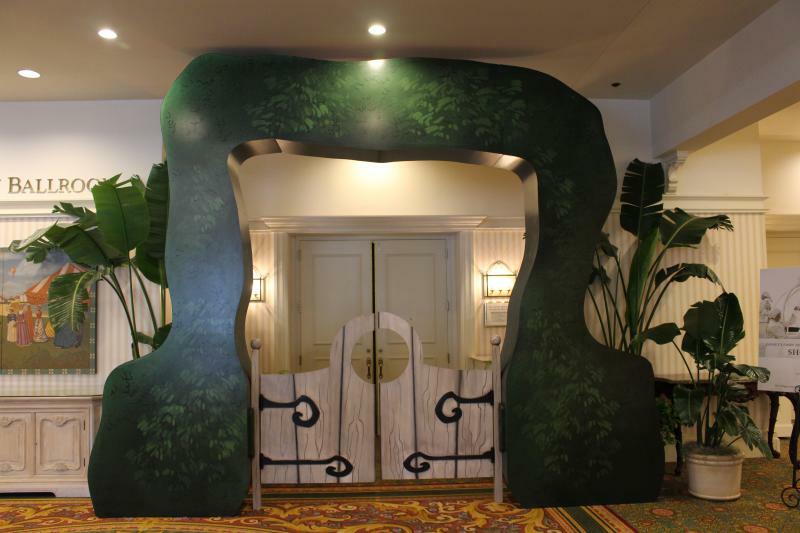 This year’s signature entryway was a garden arch, perhaps in keeping with the numerous Alice In Wonderland touches at the showcase. Whatever you do, do NOT mix those rooms up! 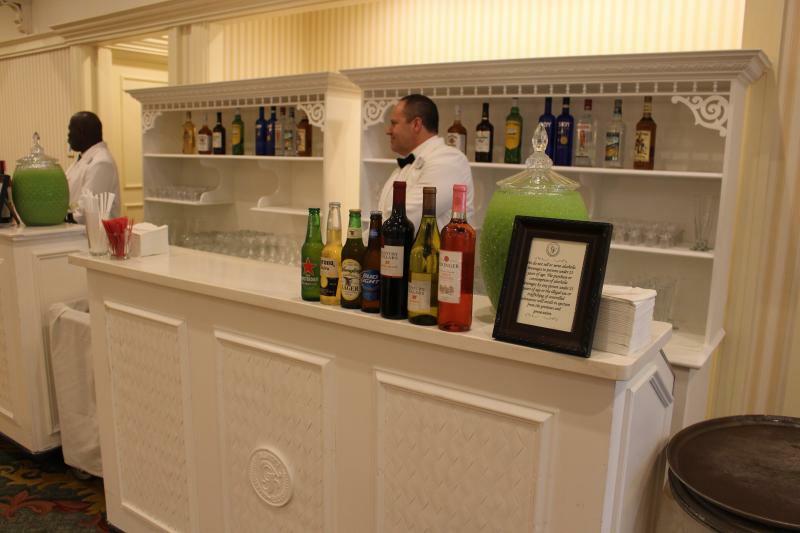 A cash bar was located halfway between the exhibition hall and the breakout rooms, making it the perfect pit stop for a good stiff belt once you’d learned how much all this was gonna cost. The show floor always sparkles with more eye candy than a bride can process at once. 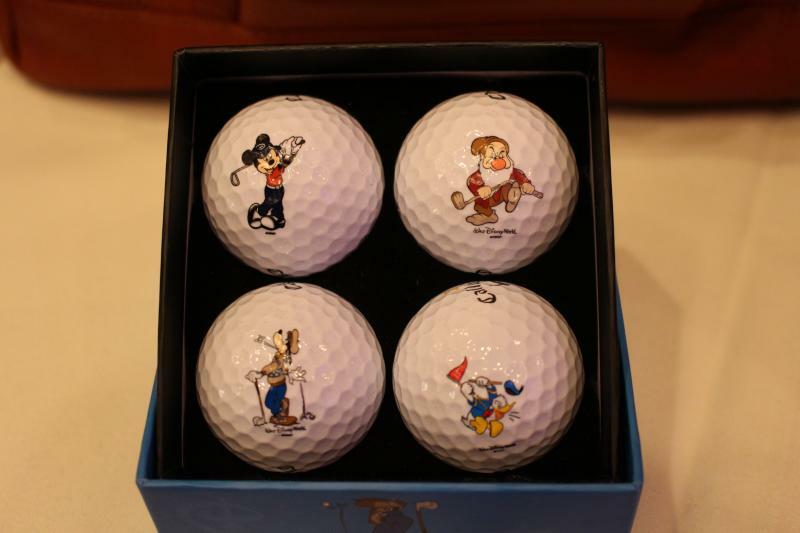 As in previous years, there were areas devoted to Alfred Angelo bridal gowns, Disney Fine Art Photography, the pastry and culinary teams (both offering free samples! 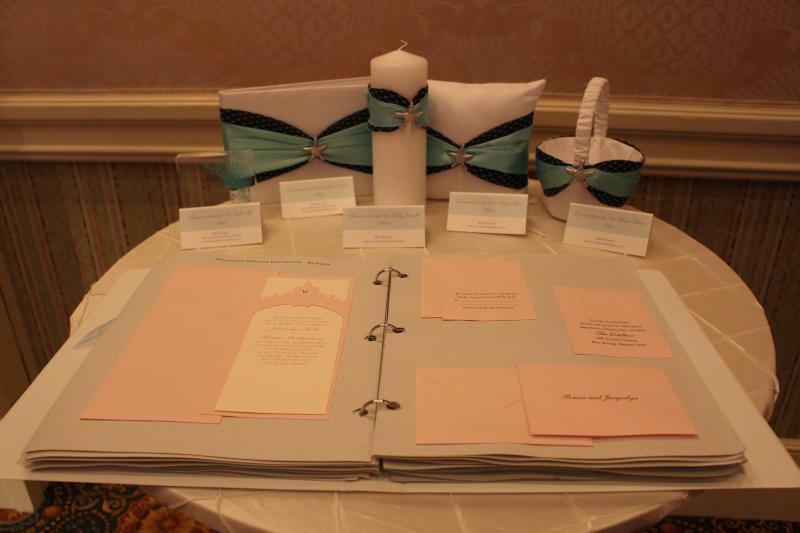 ), Disney’s Vero Beach Resort, Kingdom Magic Travel, the Disney spas, and stationery by Invitations By Dawn. Interspersed with these were gorgeous table setups by Disney Floral, photo products by Disney Event Photography, and DJ Charles Miles’ setup. Let’s start with the most important part of any wedding: Cake! And don’t forget cake SAMPLES! I was surprised to see some of the same mini-cake designs displayed at the last showcase, but it made more sense when I found out they were all fake and would be packed up at the end of the day to await another showcase. (Why, yes, I did ask whether I could eat the leftovers!) Another interesting thing I learned, which will be music to the ears of the DISBoards’ Cake Chatter Thread fans, is that Disney is trying to put together a website devoted to standard celebration cake options around Walt Disney World, with photos and everything! 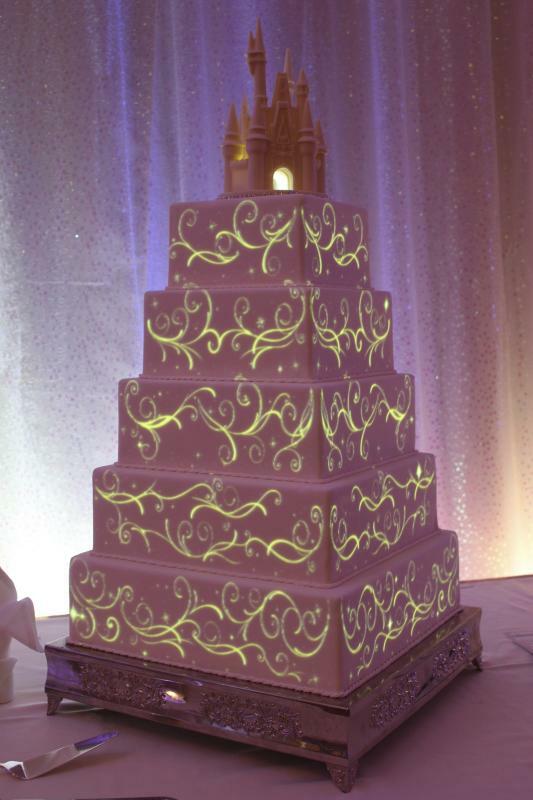 Disney’s Fairy Tale Weddings’ big showstopper this year was a 5-tiered projection-mapped cake. I took a crappy video of it, but you’ll do better to watch this nice, steady video shot by Inside the Magic. 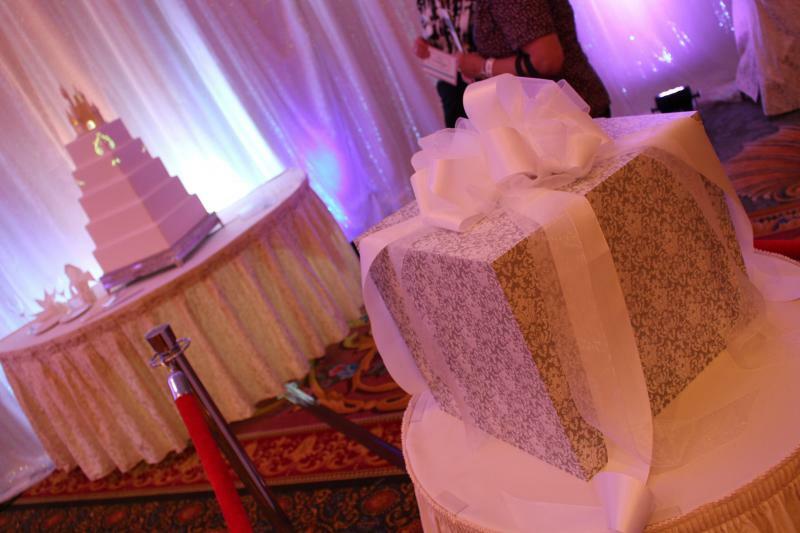 The video is projected onto two sides of the cake from inside a ginormous gift box. There are three different loops, which we were shown in succession: Tinkerbell, Cinderella’s carriage and a scroll-y Happily Ever After design. They can also customize it with your photos and videos or different quotes, plus change the shape and size of the cake. I thought it was a really cute gimmick til I found out it costs $2,900 before you even factor in the price of making some of the tiers edible or adding the castle cake topper. You could have a very posh private dessert party or rehearsal dinner during a fireworks show for about the same price. On the other hand, I guess in the end it’s no more extravagant than paying three grand for a 10-minute ride in Cinderella’s Glass Coach, and this lasts for the whole reception! Plus, it counts toward the new Wishes Enhancement Minimum. Another of the showpieces was a lavish Mad Hatter Tea Party-themed table, complete with steaming teapots and bread-and-butterflies! Interestingly, there were prices listed for individual elements of all the table mockups at the showcase. This one costs $900 per half of the table you see here. The was a spectacular Alice In Wonderland-themed cake to go with the table setting. We shot Lou shooting a DEP photographer shooting that arch… How meta! It’s always nice to look at pretty ladies in pretty dresses. Man, how bored they must’ve been, though! Some of the brides I talked to found it a bit frustrating that there was no info on the style names for each gown. 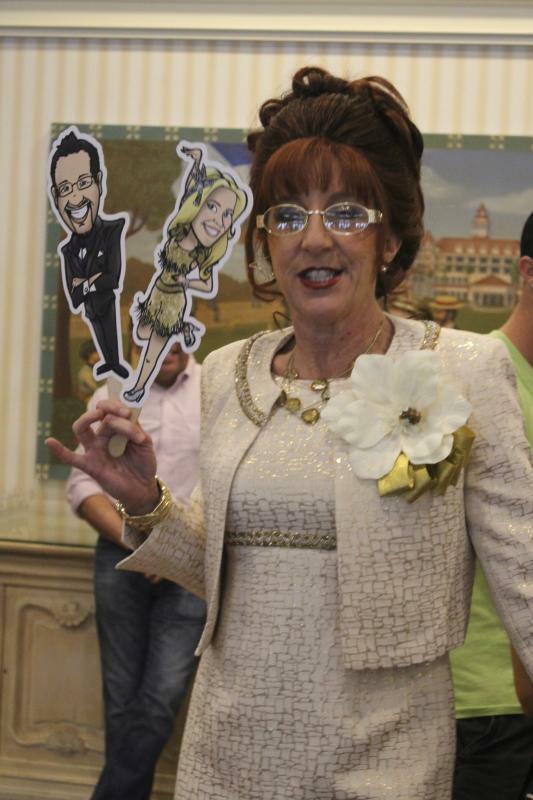 And a few lamented the demise of the salon Disney set up in 2011 where you could try on different Disney gowns. Please forgive Patrick for not taking a bunch of photos of the coach. He took SO many last year! 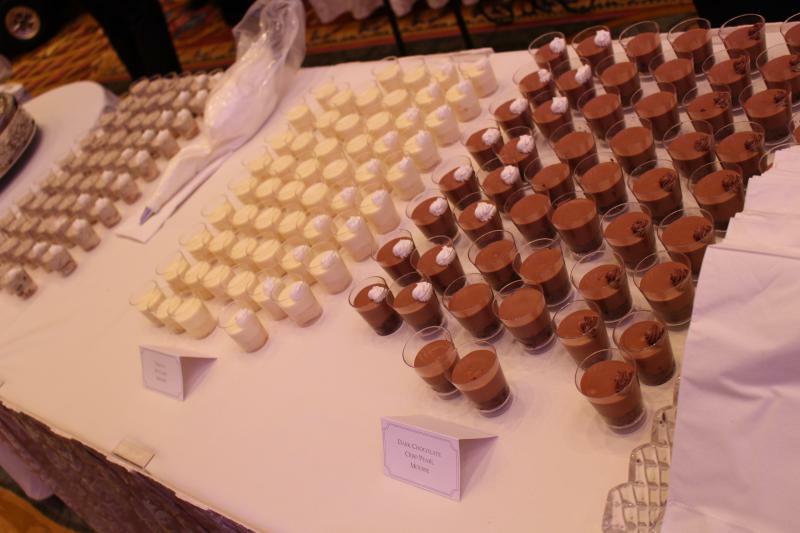 One of the smartest ideas Disney had was to offer samples of reception-type foods at the bridal showcases. Last year people complained of the overly ambitious flavor profiles and precious presentation. This year is was straight-ahead sliders, short rib, sweet potato hash and mashed potatoes—tasty! There was also a gorgeous salad action station done up in Disney Floral’s Farmer’s Market theme. 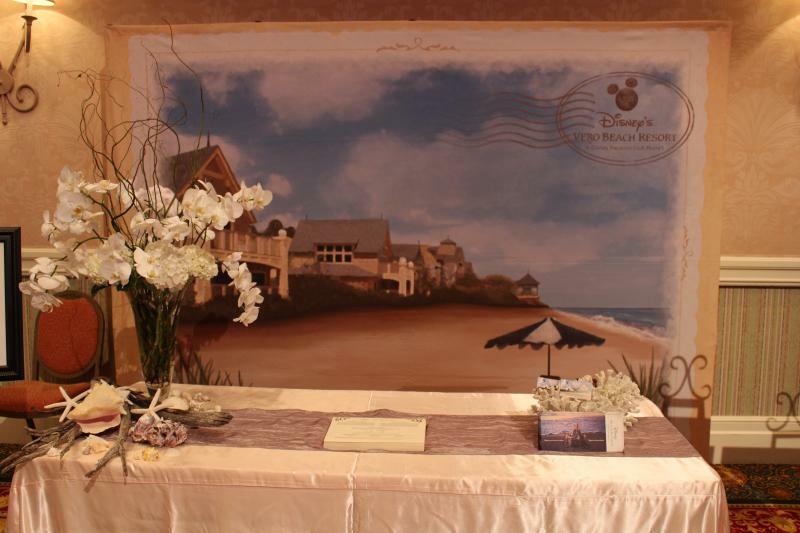 Disney Event Photography had various printed products on display throughout the ballroom, and there were representatives answering questions. They also had a curious little mock chapel set up where you could have your photo taken. I half expected to see the pews filled with attendees balancing short rib samples on their laps, but everyone gave it a wide berth. 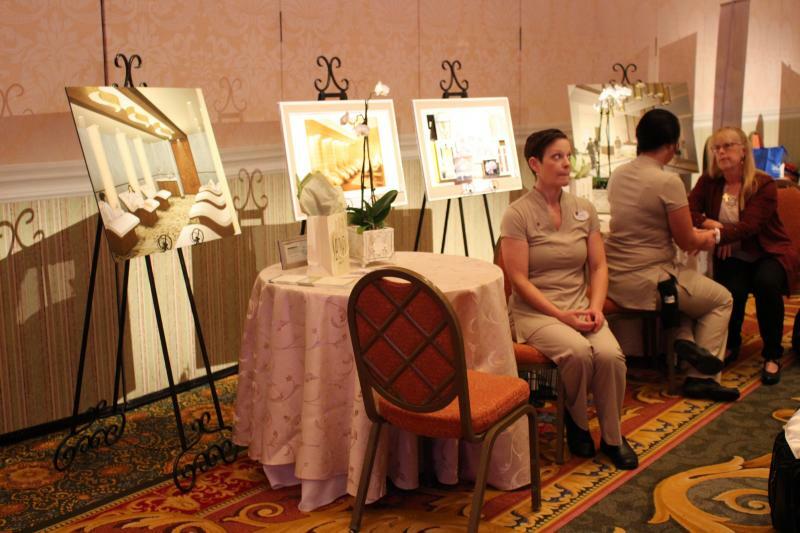 The Disney Spas were giving mini makeovers at one end of the room, and Disney’s Vero Beach Resort had a table but no chocolate turtles in graham cracker sand this year… Dang! 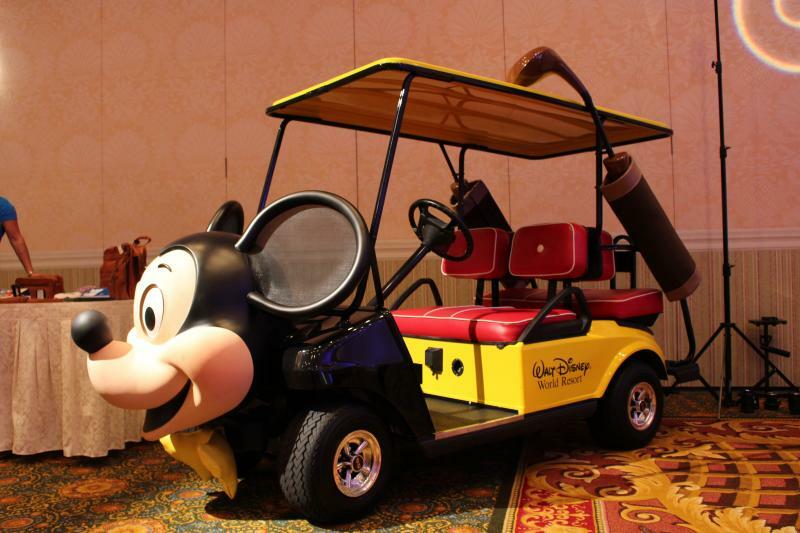 The freaky Mickey golf cart was back, next to a table that I don’t know what it was… “Stuff We Think Dudes Like” perhaps? Our first seminar was “Be Our Guest.” The session was led by the personable and well-spoken Chef Ken from the Grand Floridian, who was ably assisted by Chef Jacob from BoardWalk Inn and occasionally heckled by a phalanx of other chefs who stood at the back and offered their opinions as needed. The content was excellent—exactly the kind of guidance couples are looking for at an event like this. Chef Ken covered menu planning and tasting, the pros and cons of buffet and plated menus, food presentation and action stations, duo plates (two proteins on one plate) vs. crown service (guests don’t place their orders until they reach the reception), food trends and theming. He also explained the terminology of catering and encouraged couples to customize their menus with favorite dishes from the parks and family recipes. You can hear audio of the entire presentation (about 80 minutes worth!) by clicking the blue audio player below. 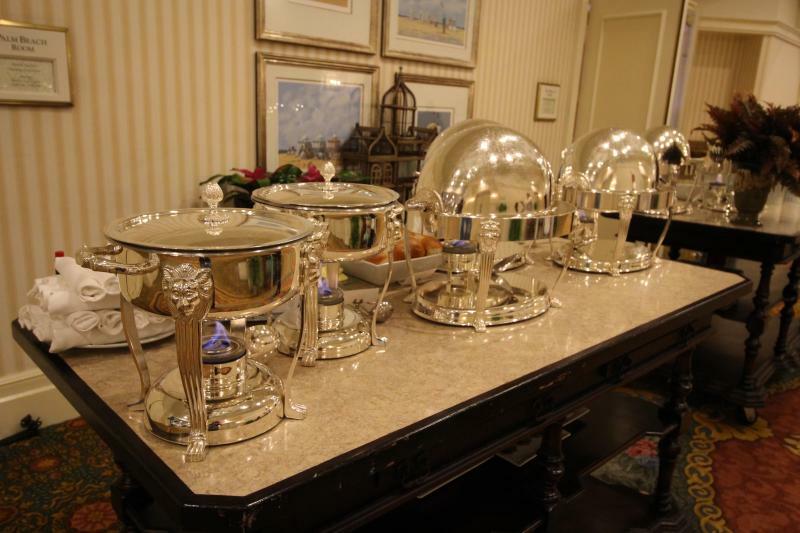 Chafing dishes! We *just* learned about those!!! From the name, I thought this session would be about entertainment options, but it turned out to be about 30% floral and decor tips and 70% Disney Event Photography harangue. I thought the floral and decor portion had some valuable material, especially the tips for saving money and distinguishing among what you might call the bronze, silver and gold variations on a theme. In speaking with other attendees, we felt that some of the money-saving tips were sort of obvious (get smaller bouquets, use fewer and cheaper flowers). But, having interviewed numerous florists over the years, I can attest that’s pretty much what any florist will tell you—it’s not like there are any dramatically novel money-saving techniques that Disney missed. The photography portion of the session had a sort of aggressive, defensive tone that many of the people I chatted with picked up on. For example, I agree that every ceremony should be “unplugged” to keep guests in their seats instead of competing with the pro photographers to get shots with their phones. But it seemed like *we* were being chastised, and there were way too many shots of guests (non-Disney wedding guests, of course!) trying to take photos. Another example is when they compared sets of three shots side by side, showing the RAW, color-corrected and “enhanced” versions. It seemed like they were implying that other photographers would just give you a dump of RAW images, which no photographer would ever do because you need special software to open them. I liked where they were going with visual comparisons of different styles of photography within one wedding. They also talked about all the props they can provide for photos, as well as tempering the expectations of brides who want to get Magic Kingdom Bridal Portrait Session shots that are identical to ones they’ve seen online. You can hear audio of the entire presentation by clicking the blue audio player below. 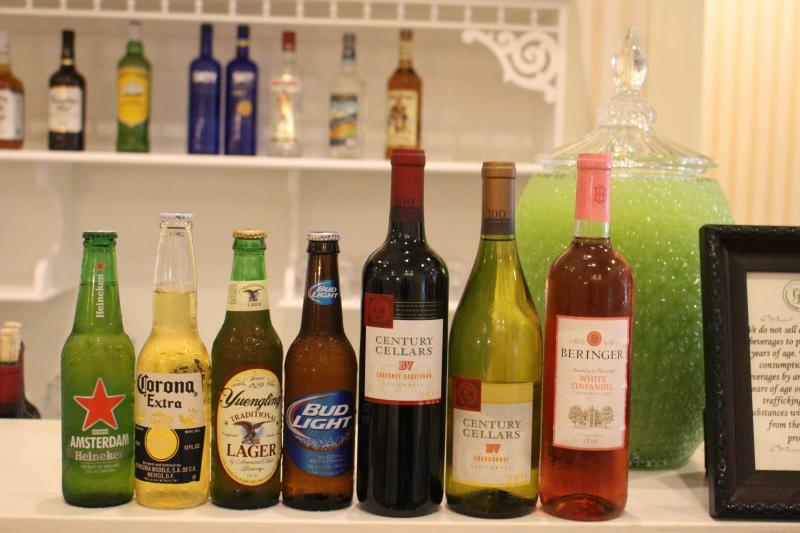 After the showcase ended, there was a separate ticketed event from 2:30pm—4:30pm sponsored by Jackson Family Wineries. 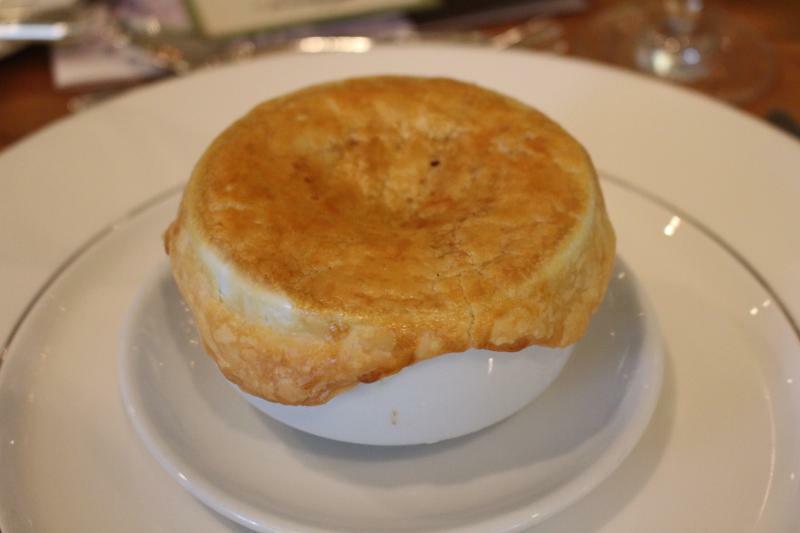 It was a chance to taste food and wine pairings prepared by Grand Floridian Convention Center Chefs and Master Sommelier Thomas Price—and a great opportunity to have a mini tasting session. it was also nice to see the popular wedding venue The Whitehall Room done up, including the light-up trees you can get for free if they aren’t being used elsewhere on your date! There were less than 50 of us at the session, and they’d emailed each of us to ask about dietary restrictions or preferences. I’m sure they laughed up their sleeves when I told them not to serve us any booze, what with that being half the reason for the event! When we met the other couples at our table, I wondered how carefully they’d arranged the seating plan, since we had the perfect ratio of former Disney brides and grooms to prospective Disney brides and grooms. It was fun to meet people in different stages of the process and try to sell them on the idea of a Disney wedding. The menu was probably the most adventurous I’ve encountered at Disney outside of Victoria & Albert’s. 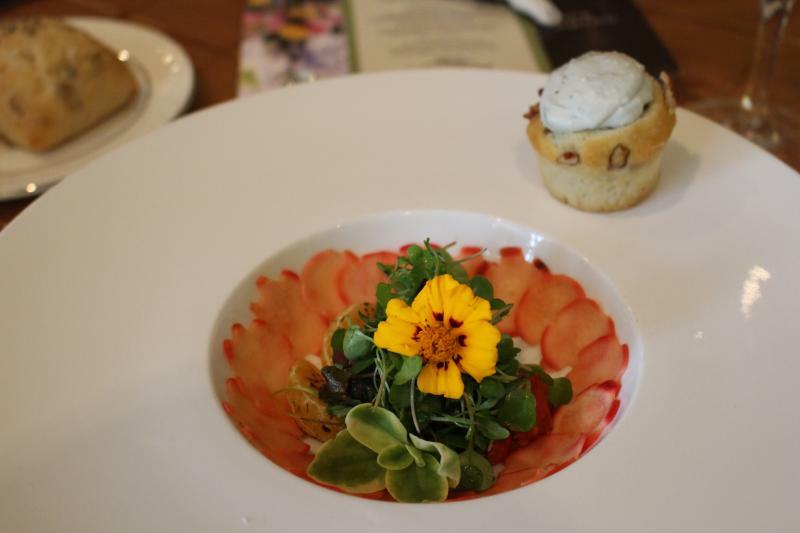 As each course was set before us, the chef would explain the idea behind it and the sommelier would talk about why he’d chosen the wine pairing. I don’t think I was the only one who burned her tongue on this soup right out of the gate! I was kicking myself for landing on the DL before we’d even started playing… From what I could taste, it was very rich, very creamy and very salty. I gobbled up the cupcake but passed on everything else. Patrick ate every last bite, though he said it wasn’t very sriracha-y. The less adventurous eaters at our table (including me!) were not crazy about this one. 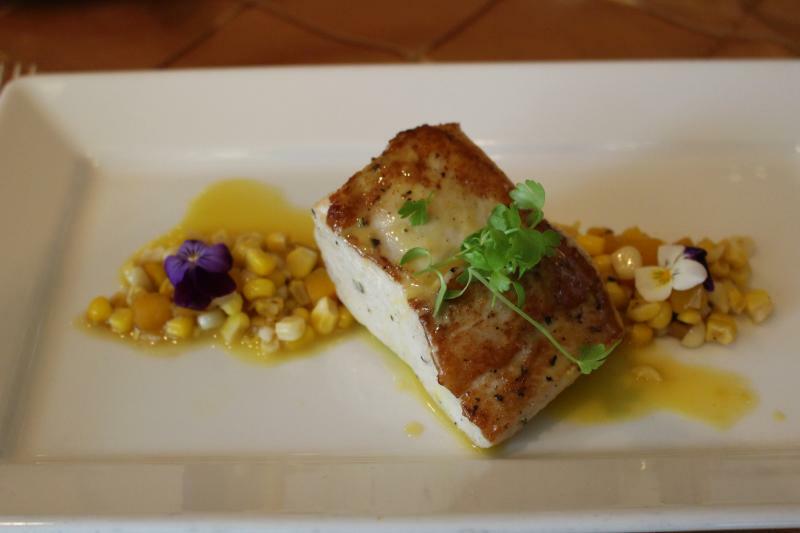 This was hands-down the best-prepared piece of fish I’ve ever had at Walt Disney World. It had the perfect sear on the outside and was moist but still flaked easily on the inside. I didn’t even mind the saffron! 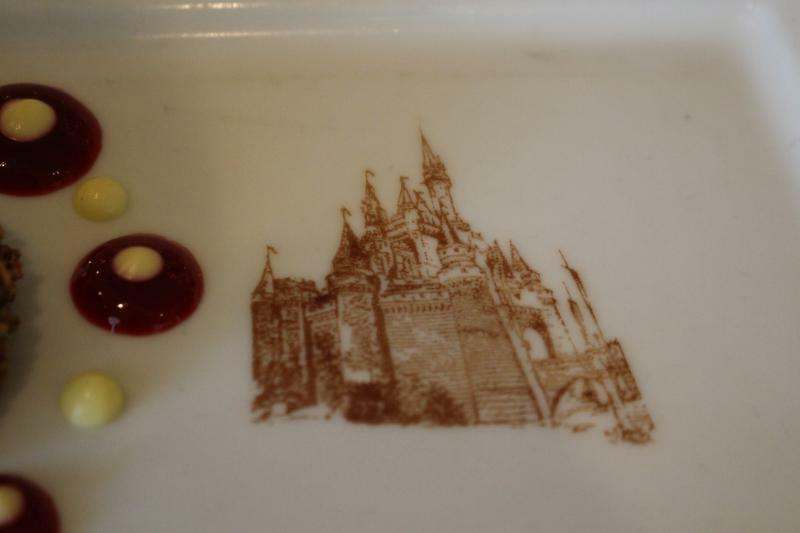 I was too busy licking the plate to notice what anybody else thought of it. 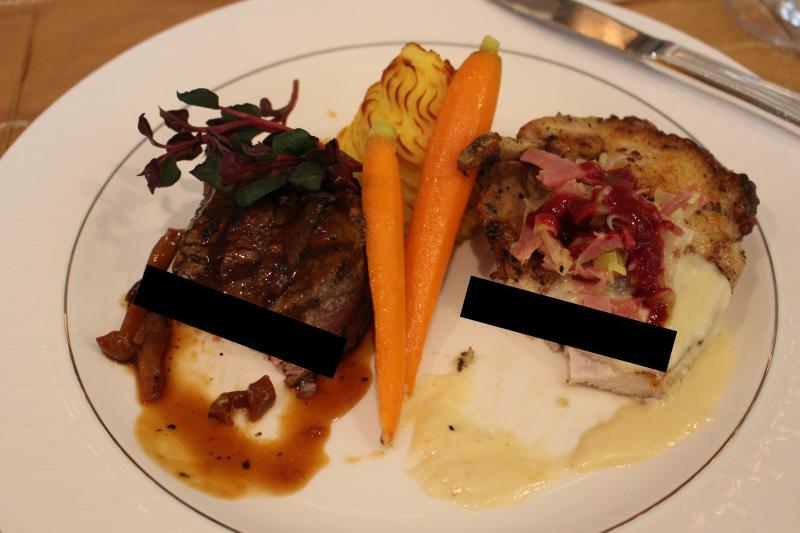 Censored for your protection: I forgot to shoot the Grilled Filet of Beef with a Wild Mushroom Veal Glace and Herb-roasted Chicken, Gruyere, Leeks & Prosciutto with a Raspberry Veloute Served with Duchess Potato and Crowned Baby Carrots before I dug in! Usually Disney cooks the H outta its steaks, so we were really surprised to find this one on the rare side. It was decent. The chicken…. No matter what they put on it, it’s still a boring old piece of chicken. The Duchess potato had the texture and flavor of Playdoh but was slightly less salty. This was where Disney’s typical restraint with flavors came in handy. No way would I have liked this if it actually tasted like hazelnut or was smothered in raspberry sauce. But as it was, I ate the whole thing! Patrick is not a fan of fancypants desserts, so I got half of his too. Overall, An Afternoon of Food & Fine Wine was a really nice experience. I felt like the chefs pulled out all the stops with the quality of ingredients, interesting combinations and top-notch presentation. 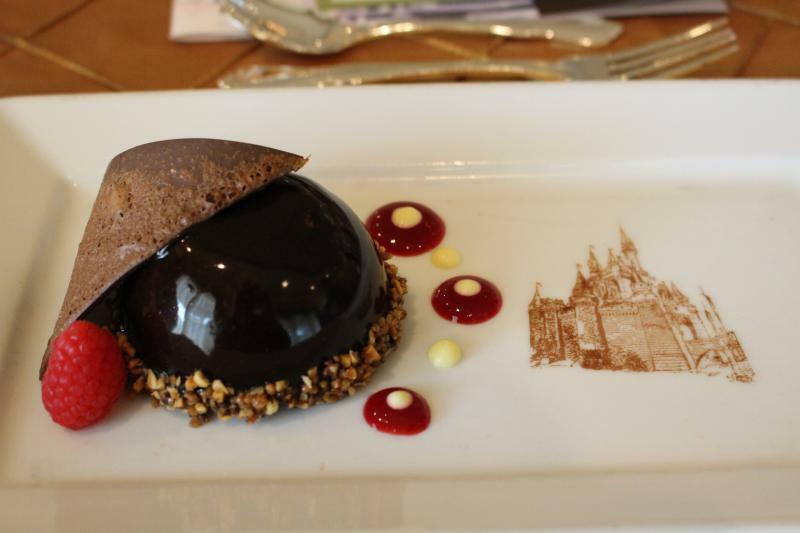 The service was excellent, and I think that anyone considering a Disney’s Fairy Tale Wedding would feel like they were in good hands as far as the menu was concerned. 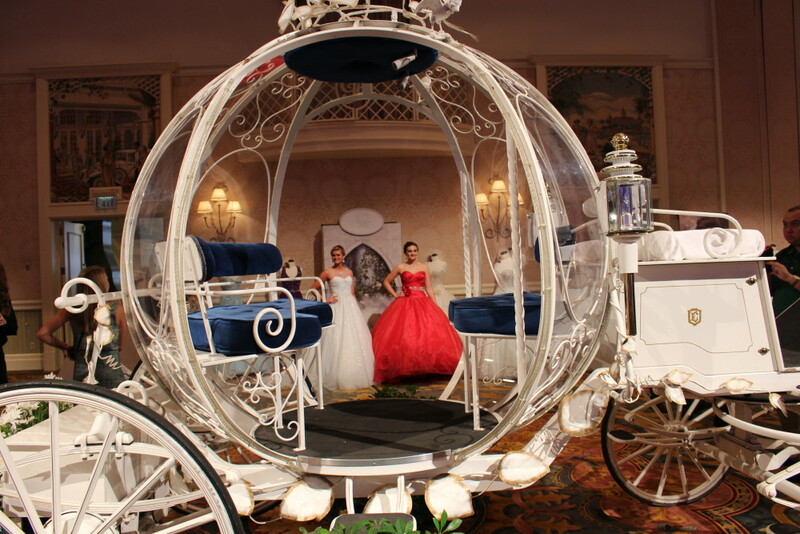 As for Disney’s Fairy Tale Weddings’ Bridal Showcase, I still think it is a fun experience for prospective brides who live close enough to attend without spending too much on travel. Seeing things and meeting the staff in person are both huge perks. If you can’t make it to the next one, though, don’t worry. You’re not missing out on any crucial step in the planning process. 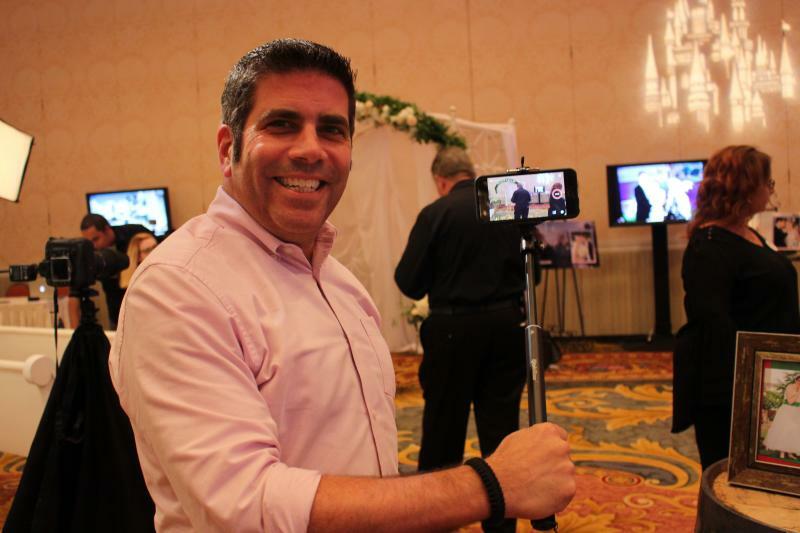 Tune in to next week’s episode of the Disney Wedding Podcast to hear the reactions of other brides who attended the showcase! Obviously you attend the event as its your job but did those other former brides who were at the tasting say why they were there? They said they just wanted to relive the fun! I liked those two setups too. I’m not big on decor, but do appreciate how these tables were all made up so nicely. Very fancy pants! 😉 I think you can customize the design, but I’m sure it would just add to that base price of $3K just for the projection. The swirling Wall-E and Eve would be amazing! Or how funny would it be if they could rig it so that whatever projection they have is interactive with guests like Crush is in Turtle Talk? So much yummy food! I’m so jealous! The desserts were calling my name. So sad that so many of them were just “for show” and not edible. (Good for you for asking about left overs. That’s my girl! ;D ) I really loved the Alice cake and whole wonderland decor. They really outdid themselves with the decor. Even if I had unlimited funds, I don’t know what I would choose. They have so many good options. Were there any stand out things that you would want for a future celebration if money were no object? Carrie, I’m interested in what was said in the photography presentation regarding brides expecting to get the photography they see online. I remember your MK photo session was a bust. Was it their opinion that what they show on their website isn’t representative? If only! No, all they said was that brides can’t expect to get *exactly* the same shots due to time of day, time of year, and the effect they have on lighting. You can listen to audio of the whole presentation by clicking that blue link above the slideshow for Edu-tainment 101. Hi Kristie! It was so great to meet you at the food and wine event. Please let me know if I can help answer any questions. You may also be interested in joining one or more of the Disney wedding-related forums or Facebook groups listed in the footer. DISbrides and Disney Brides Diary (both on Facebook) are particularly active! Great article! Is there anywhere else I can go to see the photos in a gallery setting? The slide-shows weren’t cooperating with my ancient Mac. Also, how does one get tickets to this event, how far in advance are they sold? Dangnabbit! The first slideshows I used weren’t showing up for some people in certain browsers, so I went with these, and now I find out other people are having trouble with the new ones! Sheesh… You can see the whole album of photos here: http://s157.photobucket.com/user/lurkyloo/library/DFTW%202014%20Bridal%20Showcase Sorry about that!